During the past few years, Leland (aka Brett McLaughlin) has emerged as top tier, hit pop songwriter. He has co-written hit songs for Daya (“Hide Away”), Troye Sivan (“Youth”) and Selena Gomez (“Fetish”). Notably, he’s also a promising new artist who is currently getting exposure via Spotify, Apple Music, Live Nation and YouTube. Originally from Biloxi, Mississippi, Leland attended Belmont University in Nashville, TN, and then moved to Los Angeles in 2012. He originally signed a music publishing deal with EMI Music, which has since merged with Sony/ATV Music. In addition to his songriting and artist career, Leland has branched out into scoring music for movies. He composed the score (with Bram Inscore) for the upcoming teen comedy, Sierra Burgess Is a Loser, which stars Shannon Purser (ftom the Netflix series, Stranger Things). 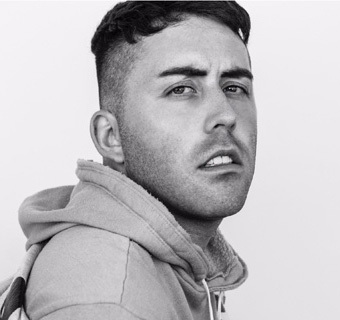 We are pleased to do this Q&A interview with Leland: He tells how he got started in the music business, and how he co-wrote hits with Daya, Troye Sivan and Selena Gomez. DK: Where are you from, and how did you get started as a songwriter & musician? Leland: I was born in Biloxi, Mississippi, and grew up one town over in Ocean Springs, MS, in the Gulf Coast. And then when I was 18, I moved to Nashville to go to Belmont University. I had so much fun at Belmont, and I met a great group of friends who are all killing it right now, doing really well at what they do in music. While I was at school, I just took advantage or every opportunity that Belmont offered. I went in there with a really clear idea that I wanted to graduate with some type of (music) deal, because I knew that it was possible. At Belmont, they did these showcase series—they had the urban showcase, the pop showcase, the country showcase and the Christian showcase. Basically, everyone who performed did different genres, and they all needed songs. So I sort of became the person within our group of friends that people would come to, to ask for songs that they could perform for these showcases. I very clearly remember my friend Jenna coming to me and my friend, Steven. She was like, “I wanna do a country showcase but I need songs.” So Steven, Jenna and I would go to a practice room, and we wrote her some country songs that she performed in the country showcase. And for us, that was such a big deal. That was the first time, seeing someone else sing a song I’d written. That was really my first introduction to writing for other artists. DK: After you finished at Belmont University, what was your next step in pursuing your music career? Here’s the video of Daya’s hit “Hide Away,” which was co-written by Leland. Leland: I originally signed with EMI Music Publishing, when (music exec) Jon Platt was there (he’s now CEO at Warner/Chappell Music). I was connected to him, and he heard a couple of my songs that I played piano on and recorded in college. He then offered me a publishing deal and signed me. After I signed the deal, I packed up everything and moved to L.A. as soon as I graduated, which was about six months later. When first I got to L.A., it was really tough. I wasn’t consistently writing good songs, and I wasn’t in a place where [EMI] could place me in high profile sessions and I would deliver. So I had to hustle for a few years, and I even worked full-time jobs while having a publishing deal. My friend Gino Barletta and I probably wrote 200 songs in that time, for artists whose projects never came out. We just wrote and wrote. Then one day, Gino called me and said, “Hey I’ve got this girl named Grace coming to town (she later changed her name to Daya). I used to teach her voice lessons in Pittsburgn. Her parents want her to sit it on a session.” So I went to the session that day, and we wrote “Hide Away.” Then that night, I pleyed “Hide Away” for my friend Dale in the car. He heard it and said, “Brett, this is s huge song…this girl is gonna be massive.” And then Gino’s manager at the time, Steve Zap, heard the song and said “I’m going to radio with this song, we need to do this.” And then the rest is sort of history (with “Hide Away” becoming a hit in the U.S. and sevcral other countries). DK: You also had a hit called “Youth” with Troye Sivan. How did you get together with Troye and write together? Leland: One of my best friends, Tyler Oakley—I have him to thank for introducing me to Troye. I was playing shows a few years ago, and Tyler brought Troye to one of my shows. Tyler’s a big social media influencer and author…he’s amazing. He and Troye were both YouTubers at the time together. And Tyler said, “You and Troye need to meet, to write songs.” Troye was just starting out at the time. Our first session was a few weeks later. I picked Troye up and we went to (writer/producer) Bram Inscore’s studio in Eagle Rock, and that was the first session. It was really the start of a relationship that has continued to this day. The song that we wrote the first day didn’t make Troye’s album, but it showed us that we all worked well together and enjoyed working together. DK: This year you have a new hit, the single “Fetish” for Selena Gomez. How did this song come together? Here’s the video of Troye Sivan’s hit “Youth,” which was co-written by Leland. Leland: I loved Selena’s Revival album, and I thought the songs were so good. On my bucket list, was to get a song with Selena. I knew that it was going to be tough to do, but I thought, let’s just write a good song and see what happens. And so I asked my friends Gino Barletta, Chloe Angelides and Jonas Jeberg if they could carve out some time to work on ideas for Selena. We then carved out a week or two, and each day we got together and worked on ideas specifically for her. Then at the end of this period, we stepped back and listened to all the songs, and “Fetish”—which at the time was called “If I Were You”—was the standout idea. So we took that song to [the hit production team] The Futuristics, and they came in on the song and made it better. And then at that point, we sent the song to (A&R exec) Aaron Bay-Schuck at Interscope Records. We pitched it to Aaron specifically for Selena. That was back in April 2016. Aaron got back to us and said he loved the song. Several months passed, and then we heard in December (2016) that Selena recorded the song, and then we heard that (rapper) Gucci Mane was on the song, and a video had been shot. Then in July (2017), the song came out. It had been a waiting game, but it was such an exciting thing for me, because I have so much respect for Selena as an artist. Getting a cut with Selena was a goal I had, and I wanted to work and write as many songs as needed until I got one that cut through. And that’s sort of been my strategy (as a songwriter). There’s no secret or tricks. If you want something, write enough songs until you get the right one. And then put the pieces together, with the collaborators. Every person attached to that song contributed something, and I don’t think the song would have existed without every person in that room. DK: As a songwriter, do you mainly write melody & lyrics, or do you also create the tracks? Leland: I would say that I mainly do lyrics and melody, but there are a lot of songs that I’ve worked on, that I played piano or I helped program some synths, or I produced the vccals. Really, I do whatever’s needed…it depends on the song or the project. DK: In addition to being a hit songwriter, you’re also an artist. Can you talk about your artist side? Leland: Yes, I just put out my first single in July—it’s called “Mattress.” And thankfully, the response has been great. Spotify was super supportive; it was on their New Music Friday in 26 countries, listed in the first 10 songs. Apple Music has also been very supportive. And lot of my friends who are artists have supported the song. I’ve always wanted to be an artist and I felt like an artist. But (at first) I didn’t have the resources, and I also wasn’t comfortable enough with myself to sing what I wanted to sing about. For a long time, I was giving songs to other artists, who were completely comfortable with themselves and said whatever the hell they wanted to say. For me, it took me a little longer, but now I’m honest and confident in what I want to say as an artist. I just did a remix of “Mattress” with Allie X which has also gotten good support. Also, I’m going to be touring next year and I’ve just gotten management (Full Stop Management with Brandon Creed). So the pieces have all been coming together over the past few months, which is really exciting. DK: Currently, do you have other cuts, or artists that you’re excited about working with, that you can talk about? Leland: Someone that I’ve really grown to love and respect as an artist & writer is Sabrina Carpenter. I co-wrote her single called “Why” that’s out right now. We have quite a few other songs that we’ve done together; I just really believe in her, and I believe she’s the next one to break out of the Hollywood Records/Disney mold and really blow up. I have my first country cut coming out in November, with Kelsea Ballerini. It’s called “Miss Me More.” I’m really proud of it and I’m excited to be a part of it; I wrote it with Kelsea and David Hodges. I also wrote a song with Rachel Platten that will be on her new album. I think Rachel is an incredible songwriter. I love her voice…she’s so fun and easy and positive to work with. Also, I just did a movie score with Bram Inscore, who produced a lot of Troye Sivan’s first album. The movie is called Selena Burgess Is a Loser and it stars Shannon Purser, who was in (the Netflix series) Stranger Things. I also wrote 11 original songs for the movie, which is a teen comedy film. I hope to work on more movie projects in the coming year.